The Husky 56 inch x 23 Drawer Tool Chest and Cabinet Set is a heavy duty, 19-Gauge steel, tool storage unit that is rated for 2,500 lb. loading capacity. The 9.5 inch deep chest lid storage along with the 23 drawers provide 37,795 cu. In. of storage. The 100 lb. rated, soft-close drawer slides keep the drawers from accidentally opening or from slamming shut. The full length drawer provides convenient storage for longer items, and the small drawers keep smaller items in a confined space. Drawer liners are included to protect and keep your tools in place. The built in full length power strip includes 8 outlets and 2 USB ports. Also included is a rechargeable magnetic LED work light. This light charges via a USB connection, has 3 light modes, a recessed folding hook, and produces up to 360 lumens. For added security, both the chest and cabinet are fitted with a barrel key lock system. 5 inch x 2 inch industrial grade, polypropylene casters (4 swivel with brake and 2 rigid) will support up to 2,500 lbs. Keep your workshop clean with the Husky 26-inch Four-Drawer Tool Chest in Black. This Husky tool cabinet features a detachable top chest for simple movement and reorganization. Designed to offer increased durability, it has an all-welded 21-gauge steel construction, ideal for professionals looking for quality and functionality. This Husky tool storage system has an industrial powder coat paint finish with rust-resistant properties, protecting the unit from the wear and tear of regular use. It is made with four drawers - three small and one medium and features a total holding capacity of 2,862 cu. inch, offering plenty of storage for all your equipment. Ideal for smooth operation, this high-quality tool chest is designed with ball bearing slides that can hold up to 50 lbs. to handle heavy loads. This Husky tool cabinet features an internal locking system with two keys. Designed to take up less space, it is built with two recessed handles, so you can place it in any corner. This 9-Drawer tool chest and cabinet is made from high grade all welded steel construction and finished with tough black industrial powder coat paint. All drawers feature 100 lb. rated ball bearing drawer slides featuring Secure Latch retention system. All drawers have extra-large full width aluminum drawer pulls for easy access. Heavy Duty 5 inch x 2 inch casters rolls easily under heavy loads. Two swivel casters have brakes to keep the cabinet in place. An ergonomic tubular side handle is designed to comfortably fit your hands for easy pushing of cabinet. The drawers are secured by a keyed internal locking system and come with 2 keys. This Husky 36-inch 12 Drawer Tool Chest and Cabinet is great for storing and organizing all your tools and hardware. The chest is made from high grade all welded steel construction and finished with tough industrial red powder coat paint. 12 Drawers and easily accessible top till provide a total of 21,704 cu.-inch storage capacity. Drawers are all full-extension and glide effortlessly on ball-bearing slides that can support up to 100 lb. These slides also have a unique Secure Latch retention system that ensures your drawers are completely closed and secured. Top till has an integrated power strip with 4 outlets and 2 USB ports. Premium Drawer Liners included to protect your tools and drawers. The reinforced top lid is supported by gas struts which make it easier to open and close. An ergonomic handle and 5-inch x 2-inch casters allow you to easily move your cabinet around your workspace. Total weight capacity of the cabinet is 1,200 lb. Both the chest and cabinet have an internal keyed locking system, with 2 keys provided, for added security. 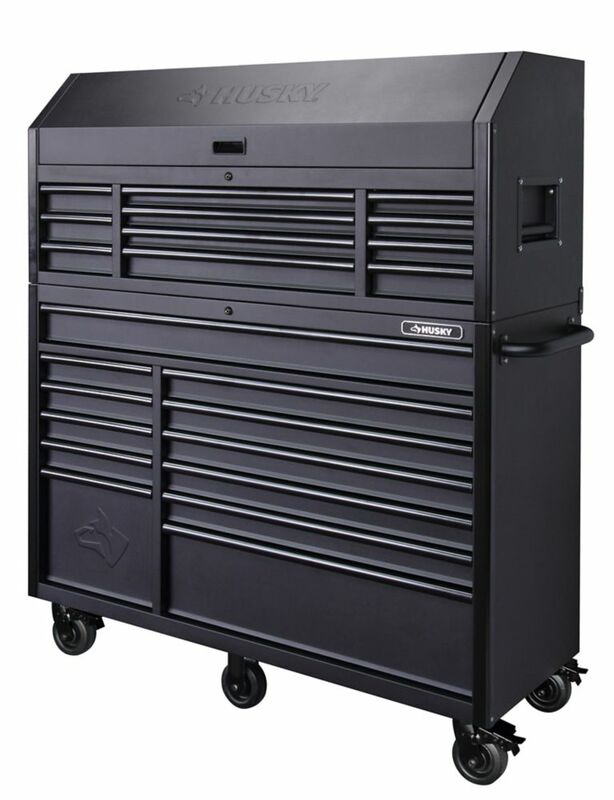 This 8-drawer chest is made from high grade all welded steel construction & features an extra-tall till to accommodate larger tools & rechargers. Knockout with grommet cover in lid for electrical. It's finished with a tough industrial powder coat paint. Ball bearing drawer slides hold up to 50 lbs and let drawers move easily under heavy loads. Oversized full length aluminum drawer pulls make it easy for fingers of any size to open the drawers. The reinforced top lid is supported by gas struts which assist in opening and closing the lid. Lifting top lid allows drawers to unlock. Internal keyed locking system for security. Includes drawer liners to protect your tools. 56-inch 23-Drawer Tool Chest and Rolling Cabinet Set in Textured Black Matte The Husky 56 inch x 23 Drawer Tool Chest and Cabinet Set is a heavy duty, 19-Gauge steel, tool storage unit that is rated for 2,500 lb. loading capacity. The 9.5 inch deep chest lid storage along with the 23 drawers provide 37,795 cu. In. of storage. The 100 lb. rated, soft-close drawer slides keep the drawers from accidentally opening or from slamming shut. The full length drawer provides convenient storage for longer items, and the small drawers keep smaller items in a confined space. Drawer liners are included to protect and keep your tools in place. The built in full length power strip includes 8 outlets and 2 USB ports. Also included is a rechargeable magnetic LED work light. This light charges via a USB connection, has 3 light modes, a recessed folding hook, and produces up to 360 lumens. For added security, both the chest and cabinet are fitted with a barrel key lock system. 56-inch 23-Drawer Tool Chest and Rolling Cabinet Set in Textured Black Matte is rated 5.0 out of 5 by 4. Rated 5 out of 5 by Craig from Awesome box! Got rid of my Snapon Epiq box for it. I got this box last summer, I had a three piece Snapon Epiq 60' box with riser hutch and side locker. The Husky box beats it for value of storage and durable self closing drawers. I travel to Alberta fair bit as a technician and find it very durable. Yes this sounds strange but I prefer the Husky box over a $25,000 Snapon box. Rated 5 out of 5 by zys01 from Great toolbox Bought the toolbox recently. It is very good toolbox for the price. I recommend the product. Rated 5 out of 5 by greg from High Quality Product Bought this product a month and a half ago, very sturdy, better than the old husky that they still have in the store, really liked the soft close drawers, Very good alternative from a snap on tool chest. Are there locks on the drawer handles so they won&rsquo;t open when moving the box or do they only lock by using the key? The drawers are soft close and will stay closed while moving around the shop. What is the &quot;vertical&quot; depth (as in height, not length or width) of the drawers? What are the depth of the drawers?